Study: model in good agreement with satellite temperature data – suggest cooling | Watts Up With That? Global satellite data is analyzed for temperature trends for the period January 1979 through June 2009. Beginning and ending segments show a cooling trend, while the middle segment evinces a warming trend. The past 12 to 13 years show cooling using both satellite data sets, with lower confidence limits that do not exclude a negative trend until 16 to 22 years. It is shown that several published studies have predicted cooling in this time frame. One of these models is extrapolated from its 2000 calibration end date and shows a good match to the satellite data, with a projection of continued cooling for several more decades. Figure 6. Linear plus period model from Klyashtorin and Lyubushin (2003) overlaid on satellite data after intercept shift. Dotted line is model extrapolation post-2000 calibration period end. a) UAH. b) RSS. Craig Loehle reports a correction to the post of his analysis of satellite data. This demonstrates how review on the ‘net can be useful. While working with both surface and lower troposphere data, he inadvertently loaded the lt data for analysis. Alert reader Andrew at Climate Audit noticed the mistake. This has now been corrected and will be correct in the printed edition and online at E&E. The only thing different about the abstract is that the lower confidence limits do not exclude a negative trend until 16 years instead of “16 to 22 years”. October 20, 2009 in Climate data, Forecasting, Modeling. This should “QED” the whole subject of AGW… But it won’t. It is good to see peer reviewed articles published in this area, and I suspect we are going to see an avalanche of such articles, in which recent observations are shown not to square up with climate models. The climate models are going to become ever more divergent from observations – we have all seen it and now peer review articles are beginning to document this. Clearly natural climate variation encompasses both the medieval warming period (when it was a little warmer than present) and the little ice age (when it was a little cooler than present) – so I have never understood how so many scientists were convinced the warming period we had from 1979 to around 2000 couldn’t fall within normal climate variation – and had to be caused by man and CO2 emissions. This paper shows that observations made with satellite data are consistent with either flat or cooling temperatures, and even project potential cooling for years to come. I wonder what will happen if and when we have a 30 year trend of flat or cooling temperatures – will RealClimate ever admit their models are to dependent on CO2 and are clearly not correctly modeling the climate? The model extrapolation reminds me of NASA trying to predict the sunspot cycle!!!! It means to reveal the presence of something. Wow! Dig the new mobile version of the site – I must have missed the announcement somewhere. All we need now are more frequent open threads so off-topic posts don’t clutter up the discussions. Without the volcanic events in 1983 and 1991, which lower the first portion of the record, the overall trend would be almost flat. Jari (10:06:25) : Try google. It will answer most trivial questions like this. I’ll tell you EXACTLY what will happen. They’ll start screaming “global cooling” again, just like they were 40 years ago. See, this is the thing that upsets me most about this whole charade. We’ve had cooling for 11 years now, and the alarmists STILL won’t admit that global warming is hoax. How many years of cooling do we have to have before they’ll admit it? 20? 30? There’s no way we can go through 20 years of cooling without somebody screaming “global cooling”. And if they scream it loud enough (and they will) some government is going to throw some money at it to find “proof” not only that’s it’s occurring, but that mankind is causing it. And the alarmists (they don’t care what they’re alarmed about, as long as they’re alarmed about SOMETHING) will demand that we do something to stop catastrophic man-made global cooling. Christopher Monckton on Glenn Beck radio show, Youtube videos. A very important study, “Evidence for a warmer period during the 12th and 13th centuries AD from chironomid assemblages in Southampton Island, Nunavut, Canada”, has been published in “Quaternary Research”. It’s one more to sink the AGW theory, since it highlights that the Medieval Warm Period temperatures were in fact higher than today. I believe that AGW supporters will start defending that higher temperatures at the time were also caused by man, by starting some fires… But then, CO2 was very low. Uh, yeah. Right. Dream on, Paul, dream on. Yet in the conclusion they state that climate models have not predicted the cooling. Can anyone clarify this? Slowly, but surely the AGW myth is being put to rest. Papers like this chip away at it brick by brick, eventually (hopefully sooner rather than later) the whole edifice will collapse. Still a way to go though. Sir David Attenborough was on BBC radio today talking about his latest tv series. He is quite sold on the myth and occupies a special place in the hearts of the British public. Once people like him begin to express doubts we will know the end is in sight. That about sums it up – 30 years warm, 30 years cold. The only question is whether the warming trend is from the LIA or from the end of the last ice age. My guess if from the last ice age. This interglacial is running on overtime, and the impending danger is not the warming, but when the warming quits. Very good, very nice job. So a computer model says it’s going to cool? Can we do a campaign against central banking next? Huh? Can we? Please? Evan, I vaguely remember Pass Christian being mentioned in “The Puppet Masters”. Thanks for the memory jog. Satellite data since 1978 are clearly nonstationary. The early and late periods show modest cooling trends, while the middle portion shows a strong warming trend. This could be an indication of the combination of a linear or other warming trend with one or more periodic climate cycles, as suggested by Chylek et al. (2009), Loehle (2004), Klyashtorin and Lyubushin (2003), Schlesinger and Ramankutty (1994), Soon (2005), and Zhen-Shan and Xian (2007), among others. Zhen-Shan and Xian (2007) and Klyashtorin and Lyubushin (2003) noted that the result of this combination of forcings could be to exaggerate the apparent warming (and therefore the apparent greenhouse forcing effect) of the last third of the 20th Century. Empirical identification of periodic or semi-periodic climate signals has a precedent in the identification of sunspot cycles and is thus worthy of consideration for longer periods, which is considered next in the context of forecasting future climates. I also note in the paper that they suggest a 16 – 23 year cooling trend (with lower confidence) but the 12 -13 year trend is clear. Who will give me odds on the Mainstream Media not picking this story up? Leif around? He knows a bit about sunspot cycles ;). I had just watched the faux Chamber of Commerce video – it highlights a point that I’ve made before: there is a sad strain of consequentialism, whereby the ends justify the means, in the environmental movement. Lies and gimmicks are acceptable if the endstate (whatever that may be) is achieved. Here’s the forecasts for both the AO and NAO for the near-future if this helps you figure out where the rest of October is headed. So there we have. This confirms that the theory of CAGW is falsified. Just need a few of the organs of free speech to carry the story and Copenhagen is toast. Anyone want to bet that Noaa or Accuweather global warming site won’t come out with A report trying to show or adjust to show no cooling has taken place??????? The warm 1980s and 90s might have been the final “overshoot” presaging a very steep decline. Well, there’s not too much new here. The satellite data is well known. It comes down to curve fitting. Here we have some sort of parabolic function instead of the usual linear one. But nature is not a curve fitter! The temp will be what it will be, regardless of which curve we fit to the data. Let’s not start doing the poor science we blame the alarmists for just because the most recent data fits our own opinions. The hockeystick made the apportionment “100% is AGW” seem reasonable. Tenuc, I don’t think there’s any way Copenhagen will be “toast”. It’s a political gathering, not a scientific one. It’s decisions are based on another political body, a “Governmental Panel” headed by a railway engineer. Real science doesn’t get a look in. Unmasked, the well-intentioned lie, is still a lie. How sad to have wasted all this time and money on so foolish a deception. This discussion refers to the Federalist Papers as the source for understanding the meaning of the of the provisions of the Constitution of the United States. Climate Change’ Treaty: The Supreme Law Of The Land? Or Lawless Usurpation? 6. Now, let us consider the proposed “climate change” treaty. There exists somewhere a 200 page draft agreement which, during December 2009, is to be hammered out, put into final form, and signed in Copenhagen. If signed by Obama and ratified by the Senate, would it become part of “the supreme Law of the Land”? And just what, pray, are “greenhouse emissions”? Primarily, carbon dioxide, methane, and water vapor. Carbon dioxide: the gas which humans and other animals exhale, and which plants must have for photosynthesis [sounds like a good system to me]. Methane: The gas which animals belch. All very easy to control: Kill most of the people and most of the animals! Shut down our remaining industries. Stop the cars. Turn off the electricity. Cut off supplies of propane. Prohibit the burning of wood. And water vapor! Oh! We must stop poisoning the world with Water! So! The Questions are these: Does The Constitution grant to Congress the power to make laws respecting the reduction of carbon dioxide, methane, water vapor, etc. “emissions”? Is transferring wealth from Americans to “poor” nations to compensate them for our “past emissions”, one of the enumerated powers of Congress? Does The Constitution grant to the Executive Branch jurisdiction over carbon dioxide, methane, and water vapor? The answer is NO! Accordingly, if the Senate were to ratify the “climate change” treaty, the treaty would NOT become part of “the supreme Law of this Land”, because it would not have been made under the Authority of the United States. It would be a mere usurpation and would deserve to be treated as such. Do not forget: The federal government may not lawfully circumvent the U.S. Constitution by international treaties. It may NOT do by Treaty what it is not permitted to do by the U.S. Constitution. …If the federal government should overpass the just bounds of its authority and make a tyrannical use of its powers, the people, whose creature it is, must appeal to the standard [The Constitution] they have formed, and take such measures to redress the injury done to the Constitution as the exigency may suggest and prudence justify…. Somewhere in the last 29 years I missed the whole debate (assuming there ever was one) about the quality of satellite data. Since satellites started sending weather data, that data has been believed like the gospel from the mount. Was it not satellite data which introduced the idea that the Earth was warming in the late 70’s? Aren’t satellite callibrations and interpretations subject to every bit as much distortion and tinkering as tree ring data? The AMO lives! Too bad we can’t say that about the brain cells of the AGW crowd. Paul, Boudu, Do you have a link to the mobile interface you are talking about? I don’t see anything here, but everything except text is blocked where I am… Thanks. @Bill P I am not sure what algorithm they are using to do the RSS retrievals these days, but they all come pretty close, They are by no means as subject to interpretation as tree ring data is. The observed channel brightness is basically the weighting function of the channel times the temperature at the altitude. I did work on the microwave spectrometers on Nimbus E and Nimbus F in the early 70s. You do not have a lot of latitude with a correctly functioning instrument. And yes, the global temperatures in the late 70s were indeed rising due to the AMO upswing. What’s the mechanism for taking the temperature? It looks like the end point for Loehle’s input data was June of 2009. I wonder if results would be impacted by including data through September of 2009. Dear Bill P, RSS and UAH are not subject to the same “distortion and tickering as tree ring data” because unlike Mann, Schmidt, Hansen’s GISS, Britain’s Met Hadley, et al these satellite services openly disclose their means and methods. That’s why skeptics take their data seriously and heavily discount Mann, Schmidt, GISS, and Met Hadley’s so-called data. If they won’t disclose how they ‘adjust’ data and how it was collected in the first place, you almost have to assume “distortion and tinkering” on their part. Cheers. Craig, how did you take Pinatubo and El Chichon cooling into the equation? KallOut is a free Firefox add-on that allows Jari, or any other WUWT readers to select text, right click, and go directly to Google results, Wikipedia entry, or, in Jari’s case, the definition! And the bonus to WUWT readers is he won’t be clogging up the message threads! To respond to some comments, my paper says nothing about the MWP or LIA. The models that predicted cooling are timeseries models fit to the historical data or are based on patterns of ocean circulation. The models that do NOT predict cooling are the general circulation models. The paper is accessible via the link at the top of the post. You don’t have to guess what I did–you can read it. Are you funded by Al “I’m going to make billions off of carbon trading” Gore? Which then brings the question back to facts and their interpretation. What I find bemusing is the inordinate attention given to articles and material emanating from the UK. The UK is now the sick man of Europe and is irrelevant to the affairs of the world. Its time has been and gone. A relatively greater weight should be placed on articles and material emanating from the South Malaccas! Sorry about that last post. It should have been in the comments on ‘Revealed: the UK government strategy for personal carbon rations’. I am inclined to categorize all these models as being capable of predicting the past, not the future. Unless ALL the variables that influence an outcome are both known and understood, inferences as to future trends are simply guesswork. Even a simple two variable system can be unpredictable: the share market is influenced only by Fear and Greed, but what’s next week’s share price going to be? . . .
Just read Kris Kraft’s book “Flight: My Life in Mission Control” about the Mercury/Gemini/Apollo space programs. Several good quotes in there about the tendency of scientists to go off on apocalyptic nonsense to get attention, funding, and cover their rears. Basically he said every time the scientists (often) pushed the panic button during the space program they turned out to be full of crap, and just got the press, the public, and the politicians all riled up and spending a lot of money and causing a lot of trauma, and for no good reason. Sound familiar? I’m trying to understand the relevence of the smooth black and then dotted curve; which doesn’t seem to be any kind of low pass filtered version of the actual plotted data. I take it that these two Russian named individuals derived this curve on the basis of some theoretical justification. I find it hard to believe that any rational function of the real data values covering what is a finite time interval, could yield a smooth curve which shows not a jot of slope change at either end of the set of actual data. So what justifies the value at which the smooth curve starts; and why do they believe that it actually predicts what will happen next. For me; it doesn’t even predict any values within the time range of the data set. Are they not just trying to create information which does not exist. I’m happy to accept the data set of either UAH or RSS; and in fact both, as representing what their satellite sensors are sending them as data. As to how it relates to the total earth’s temperature, I have less confidence in any reality. But this smooth wave to me contributes nothing to the knowledge base. But looking at the RSS and UAH data, I see basically a flat zero line up to about 2000 and then a definite change to a higher but flatter regime, which looks like it is now turning downwards. I can’t believe that any amount of statistical prestidigitation of the UAH and RSS data sets is suddenly going to reveal out of the fog, some true function that decribes properly what is happening on a climate time scale. This is like the reclining “Snoopy” rock formation at Sedona Arizona. There’s some sort of fundamental theorem of pattern recognition that says something like:- if you have any finite number of n-1 dimensional projections of an n dimensional object; it is always possible to construct a counterfeit n dimensional object which is not the subject object but which yields the same set of n-1 dimensional projections. In other words; pattern recognition is inherently impossible from lower order representations. Fortunately we can recover many objects with a high degree of probability; so it is not a great impediment to progress. The face on Mars for example is a 4 dimensional object; those being the three dimensional physical geometry of the actual object, and the fourth being the specific collimated illumination of that object by the sun. We took two dimensional images of the three dimensional shape and at different illumination conditions from those that revealed the “face” to imaginative minds. I think that there are some parallels between the pattern recognition problem, and these satellite data plots, in trying to represent them in less detail than the raw data, and somehow discover something hidden there. Although the conventional-mainstream demands this paradigm of results-framing, it is based on untenable assumptions (in the context of complex natural systems that are poorly-understood). Although I’m not interested in getting into a philosophical debate, I mention this for the benefit of readers lacking the stats-foundation needed to filter-off statistical-framing that is a severe stretch of assumptions (which happens in compliance with conventional-mainstream scientific-communications-framing demands (…and in a few cases because people really believe, sadly)). Re: George Smith. If you would read the paper you would see that the Russian authors fit a periodic function (likely due to solar activity cycles) plus a linear warming trend to 140 years of the Hadley climate data. I then took their model and overlaid it on the satellite data to show that it predicts the long-term (not month to month) trends. The dotted line is the extrapolation of their model. In particular see chapter 2 where the gore of the radiative transfer equation is described. Lotsa fun back then when cycles were expensive. I found this today, and wonder if it is generally known. More evidence of climate cycle mechanisms. When some people say “the models” prediced this cooling term, do they mean one model predicted the cooling trend, and that model was also most accurate in matching the longer term past to observations, or do they mean in total, all the models combined, one of them got the last ten years correct, but that one totaly missed matching longer term observations? Re: David A: It is claimed that “the models” predict cooling in the sense that if you run a bunch of models a bunch of times, a small % of them will show a 10 year cooling or flat trend. However, it is only a small probability of getting such cooling/flat out of thousands of simulated years of climate. Spencer, R.W., and J.R. Christy, “Precise monitoring of global temperature trends from satellites.” Science, 247, 1558-1562, 1990. They found no warming. Now, there were several problems which have been addressed and now the record as a whole shows slight warming. I gotz a model. Its called the AMO. I predict that for 30 years, the temperature goes up and for 30 years the temperature goes down. The peak of the previous AMO was in the 1930s The peak of the present AMO is in the 2000s the peak of the next AMO will be about 2060. Empirical observation. Why the AMO? I will leave that to guys like Wunch. You got a similar thing with the PDO. Add the two of them together and you can explain a lot of the US temperatures providing you throw in a slight upward trend since the little ice age ended. Of course all bets are off if we have a big volcano someplace or the sun goes real quiet like it has of recent. Either or both of those could drive temperatures down faster than the simple AMO/PDO model suggests. The model based on the RSS just seems to confirm the AMO/PDO hypothesis. Cycles happen. It would be nice to know why, but until then accept them. Its not cherry picking a model, there are good reasons why the model that works does so. Why the things behind the reasons happen is good fodder for more PhD theses. How to explain the last 11 years? A big problem for warmist marketing is to prevent the seeding of this question in the electorate. An Australian cartoonist puts the writing on the wall under a cartoon portraying the current debate over the Australian carbon tax legislation (ETS). The citation is not to Senator Steve Fielding (portrayed as looney right) who made this his sound-bite mantra a few months ago, but Spooner cites instead the sober authority of the BBC, dated 6 Oct 09. @Timetochooseagain The Nimbus E and Nimbus F stuff was in the 70s along with some DMSP. It would have been nice to splice that on the start of Spencer’s data but I suspect the tapes (we got Nimbus E on 7 track 556 BPI from Nasa) are long since bleed through and history. The output of NEMS and SCAMS were 9 track 1600 BPI, but I think much the same archival problem presents itself. Without a uniform method of inversion, even if you had the data splicing it would have been difficult since the data is probably long since gone into the dumpster. Remember these are the same fruitcakes that extrapolated the downtrend of the AMO at the bottom of the last cycle in the 1970s with a linear model and predicted the coming ICE AGE!!! (Oh the horror of it all) These guys should go back and take stat 101 all over again until they get it right. Problem is that the average person is innumerate see Innumeracy by Paulos. These are the same people that buy People magazine. Do not expect them to understand climate. if it had not been for the aftermaths of El Chichon eruption (several years from 1982 ) and Pinatubo eruption (ditto from 1991), the “true temperature” should have been fairly (significantly? since these periods were overlapped with strong El Ninos) higher than the traces in Figure 6. It appears to me that these are not taken into consideration in drawing the “model curves” in that Figure. Or this is my misunderstanding? I think some of you are extending these conclusions out of context. The way I read the exact same text as you do, is that the past 12 years represent a downward trend, in a model that covers a cycle that is 50-70 years. 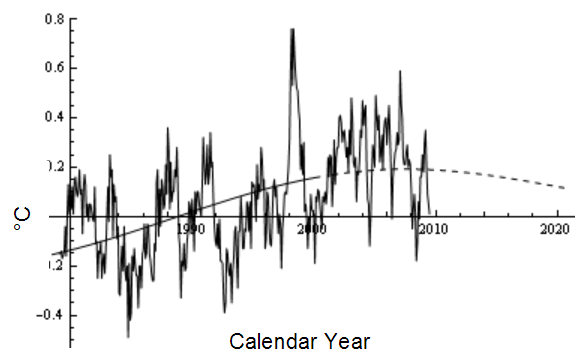 The paper acknowledges that these cycles over time exhibit and over all linear warming trend. They have basically identified the bottom half of a climate cycle. 12 years is not enough to determine clime anyway, NOAA uses no less than 30 years. Also read up on NCASI, they believe in climate change and the role of CO2. Craig, I presume that by “read the paper” you are referring to the paper by these two Russian authors; and I’ll admit I have not done that. But I’ll take your word for it that their paper shows that Hadley’s 140 years of “climate data” fits a solar activity function. That is news; since we constantly read here that solar activity does not seem to correlate with climate. If their smooth curve, which you say represents a linear increase plus a cyclic variation is actually present in the satellite information you plotted; I presume that a Fourier analysis of the satellite data, would have a spectral component at the frequency of this Russian cylce. I don’t have a lot of confidence in either GISStemp or HADcrut as representing any global climate variation; particularly before about 1980 when the first ocean buoys were depolyed, and that pretty much corresponds to the time scale for which we have had satellite data from UAH, or RSS. But now that you have predicted the future out to 2020, I plan on sticking around to watch the results. One thing is for sure; Gaia knows what the temperature is; at any point and at any time; so she always gets it right; but in Gaia’s model every single molecule is a thermometer reporting its own local temperature. Hadley doesn’t have nearly that number of thermometers; so no wonder they don’t get it right; nor does Hansen. My Mk1 eyeball interpolation of ‘uncorrected’ data, (Thanks E.M.Smith & others), and extrapolation from there tend to agree with the model, which I assume did a mathematical interpolation from roughly the same data that I analysed without the programming work. 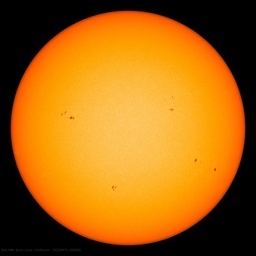 the sunspot cycle is 11 years in terms of energy output. A trend is not a ‘cycle’. This function: F(t) = G(t) + a*R(t) where R is the sunspot number, fits the data within the noise if the coefficient ‘a’ is small enough. G(t) is something that does not depend on the sun. A better phrase: Warming phase of a natural oscillation. I have sometimes used the word cycle when I am talking about oceanic/atmospheric oscillations. I prefer the better term, “oscillation”, as it describes a rather variable and somewhat unpredictable oscillating wriggle as opposed to the 11-13 year solar cycle. But I think we mince words a bit and I would not object to others using oceanic cycle, natural temperature cycle, and the like. I think it is generally understood, when the term “cycle” is used in this case, that these natural ocean and atmospheric changes are not like the dependable cycles in a washing machine. I can do better than that. I’ve spoken (online) to the author of the paper before, and I can say that your sweeping statements are too broad by far. “12 years is not enough to determine clime anyway” ORLY? Why? This is appeal to authority, and you didn’t even get the authority right. The thirty year convention originates with the World Meteorological Organization. They say 15 years would falsify the model projections. Now, there are any number of questions you could raise, and I think others have found things that are quite different (ie, shorter periods) but here is NOAA saying you only need fifteen years (that is, a mere 3 more years) before we can say, definitively, that the world is not warming as expected. NOAA seems to be forgetting their (in fact your) stipulation that short term trends are irrelevant. Interesting link. I have been thinking about the influence of the moon on ocean currents and have found a few references on that. One more piece of the chaotic jigsaw puzzle. Now the Crikey mob are quite unashamedly political activits, so that iss fine. But I eye-balled the graph and made the case that there is far more noise than trend (in lay terms) and so any perceived trend is meaningless to any degree of confidence. Thanks for doing the number crunching and bearing that out. PS> I did a modeling exercise in Tucson (Masters course) back in the day in which I applied about 9 models to US alumin(i)um consumption. They ranged from pure trend models through to intensity of use style models. Each fit with 90-95% to ex-post data.. and the forecasts varied from Al consumption dropping to almost zero to doubling in quantity over the forecast period. Personally I liked the IU model that was through the middle… Making models is fun. *ERRATA* I think some of the models actually had R^2 as high as 98% … but it’s been a while since I looked. 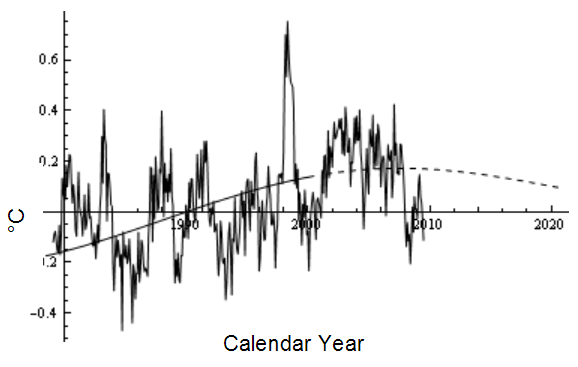 A paper that actually PLOTS and projects a sinusoid trend on the climate data! Remarkable that it seems so difficult to get anything but linear extrapolations when the old “(epi)cycles on (epi)cycles” complaint that the medieval astronomers resolved with Kepler’s ellipses now merely needs “sinusoids upon sinusoids” to show the long 900 year) and short term (70 year) trends since the last Ice Age. Let me make once more an analogy about periodicities in data. Take a clock in Rio and a clock in London. They are 100% correlated though showing different times. Is the clock in Rio pulled to follow the one in London because the Big Ben is BIG ? The absurdity is evident. We know that they are synchronized by construction. The deeper physical reason is the turning of the earth to which we tuned them . The gravitational motions that surround us are all huge clocks. By construction, they are correlated 100% because their orbits are predictable. Not because they push pull each other. The turning of each celestial body around its axis is another huge clock. The sun spot cycles are another huge clock . Clocks will always be correlated absolutely if one searches enough as the simple earth clock example shows. Now enter the earth’s climate, in contrast to the sun’s climate ( regular sun spot periodicities) it is chaotic in the everyday sense of the word, and also chaotic as in “dynamic chaos”, meaning too many push/pull equations entering for predictability. Nevertheless, there exists periodicity in the earth’s climate, viz the ice ages. A physical reason has been proposed for them. There is shorter term chaotic periodicity in climate that can be given an amplitude and frequency, as in the paper quoted in the above contribution. Suppose it is a fact ( to satisfy Leif and Svensmark) that a solar frequency is found in the climate, is it really connected with the sun, or is the sunspot cycle a cosmic clock against which the periodicity is clocked? For example take the link above that gives a lunar correlation.. It will also give a sun correlation for the same data, because both the moon and the sun cycles are giant clocks against which time can be defined. In the case of the moon though the physics is there, gravitational pull. In the case of the sun, Svensmark and others are trying hard to find/prove the physics. In a nutshell, correlations and fits mean nothing unless the physics is entered and computed for the earth’s climate. I believe that only chaotic models ( a la Tsonis et al) can really do that, because there are too many equations entering the mix. I noticed that periodicity playing around with plotting 20 and 30 yr trends. There are peaks approximately now, about 1940 and 1880. There is an increase in the “trend of the trends” that also shows in the data. The problem with using the sat data is that the start of the data is from the trough of the wave to the peak so any linear trend is going to be steep! Craig, neither the word Pinatubo nor volcanic can be found in the pdf, most certainly the two major volcanic eruptions in 1983 and 1992 do have an effect on the curve fit. Did you check? Dear All (e.g. Hans Erren) the curve shown in the post is NOT fit to the satellite data but to the 140 year long Hadley global data. At this scale volcanoes are noise, as shown by the residuals plot. The point about needing a physical model is all well and good, but often the search for a physical model begins with identifying an empirical relationship. The correlation of the 65 year cycle I use here with the changes in the Pacific Decadal Oscillation and other ocean cycles suggests a physical mechanism. Swanson and Tsonis argue for an internal ocean circulation semi-regular oscillation, or it could be forced by oscillation from the sun at that period. Too soon to tell. Forget about average global temperatures. Forget about ice caps melting and Polar Bears floating across the Atlantic on ice cubes. Forget about rising sea levels, droughts, increased hurricanes, floods and on and on. Forget about sunspot cycles or El-Nino and La-Nina, or whatever the hell else has been thrown into the mix as a distraction because none of it matters, none of it is relevant . All we have to do is drill down and focus on one thing only. That one thing is CO2. It is claimed that humans are responsible for Climate Change because of our CO2 emissions and that we need to have limits imposed because we need to reduce our emissions of CO2. Can CO2 trap in heat? Answer: NO, nothing traps in heat, substances can only absorb and re-emit heat but they cannot trap heat. Next question, does CO2 absorb heat more strongly than the other gasses in the atmosphere? Nitrogen and Oxygen which make up 99% of the atmosphere on the other hand, begin to melt at temperatures as low as 50-60 K and so are much stronger absorbers of heat and at the same time, make up most of the atmospheric gasses. This puts the effect of CO2 into context. CO2 cannot trap heat as no gasses in the atmosphere can. CO2 is a tiny proportion of the gasses in the atmosphere, so tiny in fact that compared to Oxygen and Nitrogen it is barely noticeable. The effect of such tiny amounts of CO2 being a much weaker absorber of heat than Nitrogen and Oxygen, also show that the warming effect of CO2 is insignificant. So the final question is, are we responsible for Climate Change through our CO2 emissions? Answer: NO WE MOST DEFINITELY ARE NOT RESPONSIBLE FOR CLIMATE CHANGE. Yndestad, H.; Turrell, W.R.; & Ozhigin, V. (2008). Lunar nodal tide effects on variability of sea level, temperature, and salinity in the Faroe-Shetland Channel and the Barents Sea. Deep Sea Research Part I: Oceanographic Research Papers 55(10), 1201-1217. doi:10.1016/j.dsr.2008.06.003. Some of you may recognize the connection with the timing illustrated by Landscheidt & Charvatova (putting aside the mechanisms they propose [see Yu.V. Barkin for alternatives]). The talk about correlations ‘meaning nothing’ until mechanisms are known does not advance the discussion. There are unknowns and until they are knowns we are in the exploration phase. Even if/when the physicists (or whoever) have all the answers, they will have no authority to dictate what has ‘meaning’, but once the physicists (or whoever) produce AMO, PDO, ENSO, etc. tables that work like tide tables, others will naturally shift their focus to other phenomena that remain intriguing. Maybe I should qualify my “correlations mean nothing”. They do mean something, they are a way of organizing the data coherently, and it is true that unless the data are organized it is hard to find/propose a physical mechanism. What I wanted to point out is that correlations in time with one set of variables does not mean causation, particularly if those variables are in effect another clock for defining time. I agree with you that what is most interesting is not the synchronized clocks, but rather the day. “Wavelet analysis of the oceanographic data series showed that there was no linear relationship between the 18.6-year amplitude tide and the identified 18-year temperature fluctuations.” – key words here: “no“, “linear“. They list examples, citing Currie & others, stressing (like Currie does) the need for “regional” perspective. I read 15 pages from the beginning of Chapter Four of the student’s graduate thesis. Chapter four is called “The Temperature Experiment”, and gives a general description of the Scanning Microwave Spectrometer aboard a satellite. Overlooking the acronym (SCAM) for the moment, I concluded two things. One is that the paper itself seems to this layman clearly-written, thorough and objective (though I wonder – is the siting of one’s graduate thesis adviser and teachers pretty much de rigueur in grad thesis-writing?) The other conclusion (no surprise) is that, as a method of taking the Earth’s temperature, this one is extremely complex. I’m not qualified to criticize the science, but, as I said above, I have seen very little in the way of skeptical examination of the methods and data derived from weather satellites. As has been shown by the Surface Stations project, a few misplaced Stevenson boxes can significantly mislead scientists in interpreting the temperature record. UHI issues alone may call a station’s temperature record into question. Shouldn’t we be eqully skeptical of satellite data? It looks to this outsider like it has infinitely more variables in its operation and interpretation. Thanks, both, for the citations. My comments, such as they were, didn’t make it through. ShrNfr: I read several pages of the MIT grad students’ work – enough to see how complex the satellite and software programming must be. That this is less prone to mischief and mishandling is still a point that escaps me, and I would gladly leave this to the experts – if, as I said, I just saw someone questioning these records. As for “first climate history”, I dare say that others have beat Christy and Spencer to the punch. Check your facts before you “correct” others. H. H. Lamb, “Climate History and the Modern World”, 1982, comes to mind, but I would welcome hearing about any earlier works (or later, for that matter). This is a good paper by Craig Loehle. It is possible to pull these cycles out of the temperature data. The impact of the cycles results in decadal periods of cooling and warming just as we have actually experienced (which is fairly contradictory to the climate models). But then one is still left with a general upward trend. I got numbers using a different method (that is very close to the one in this paper) of 0.045C per decade. Whether that is a natural recovery from the Little Ice Age or is the signal of GHGs/global warming is where the research should go next. We would need a causitive mechanism for the Little Ice Age and its natural recovery since then if one were to take that explanation. The most likely causes would be Solar or Albedo changes or both. And one should note that the upward trend that is left-over, is so small, we will never get anywhere near +3.0C by 2100 with it. I really don’t think it is that complicated. Hopefully routine data analysis methods of the future will not struggle so badly with complexity (…for example linear-correlations near-zero where there are purely-deterministic relations). Thanks to Craig for giving us something to think about. Appeal to authority is OK in science bud, why else would people specify in one aspect of science to become an expert? . NOAA is really good at weather, they have lots of records, and to determine climate they use 30 years. How many weathers does it take to make a climate? And – after we leave politics and hate-energy attitudes (assuming we ever could!) – that IS the single question about climate research that matters! 1) What causes the three-solar-cycle up-and-down pattern over the 70 year short term periods? What causes the long-term 900 year Roman Warming – Dark Ages – Medieval Warming Period – Little Ice Age – Modern Warming pattern we see repeating between the major 12,000 year Ice Ages? Perhaps they simply cause each other? Warm periods cause cool periods cause warm periods…. It almost looks like a self-stabilizing system.